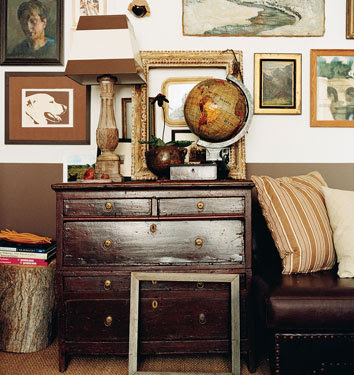 A study in contrasts: truly old versus new and earthy versus polished. 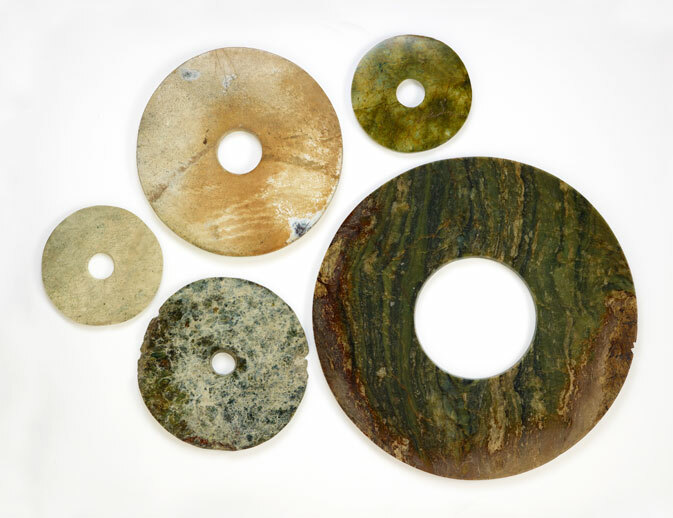 Above, Chinese jade (nephrite) disks from the Freer Gallery of Art exhibition, Ancient Chinese Jades & Bronzes. 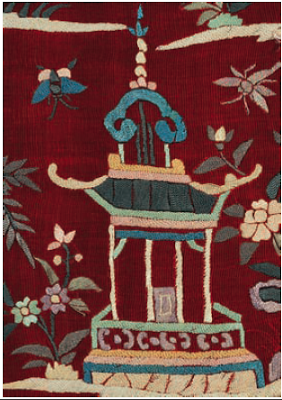 This show highlights over 100 pieces representing some of the greatest examples of Chinese art outside China. 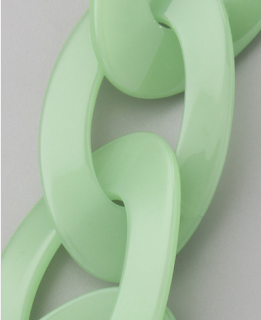 Below, a less precious 21st century object -- Kenneth Jay Lane's resin jade links. 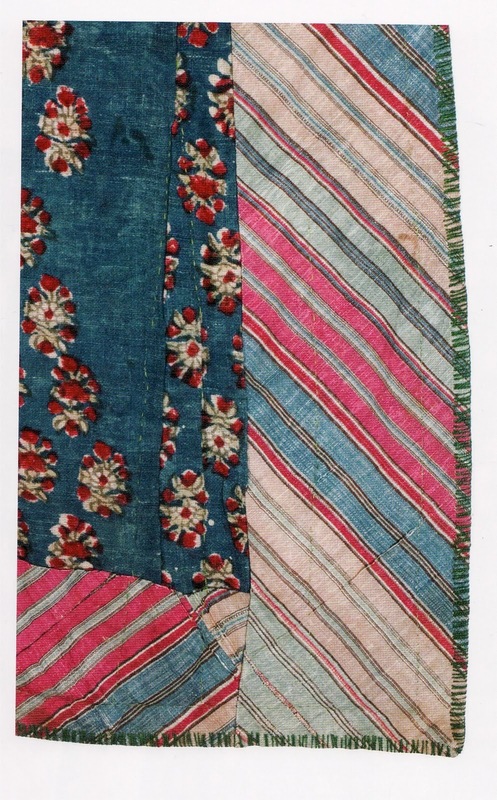 Last year when I did a post on The Textile Museum's exhibition catalogue, Colors of the Oasis: Central Asian Ikats, I opted to show the flipside of some of the 19th-century robes highlighted in the book. 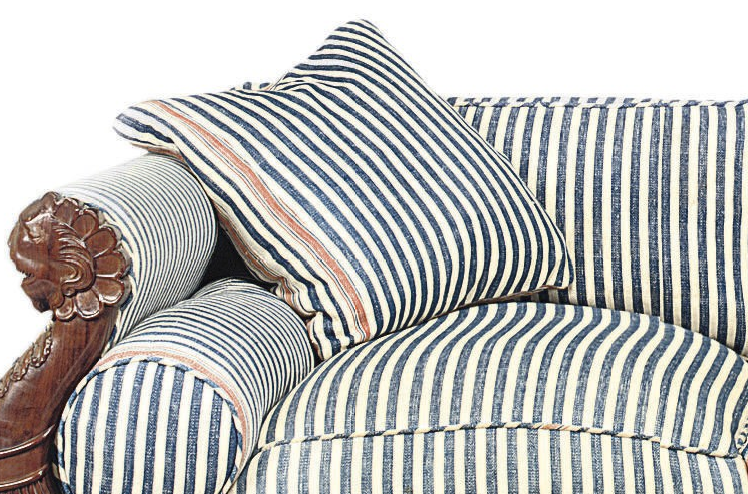 I thought the linings, made of lively patterned-cotton printed in Russia, might be less familiar than the sumptuous silk ikats shown on the outside. Apparently the humbler linings have been largely ignored in past surveys, but the TM's catalogue includes a detailed essay on these Russian export cloths written by Susan Meller. 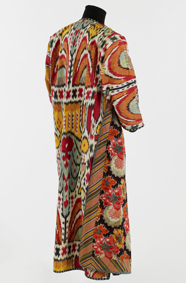 [Robe, Central Asia, Uzbekistan, Bukhara, 1860s-1870s. The Textile Museum 2005.36.2. 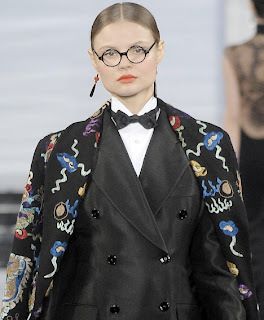 While many of the Russian prints clearly were inspired by fashionable French florals, others are a hybrid of Western and Eastern motifs, writes Meller. 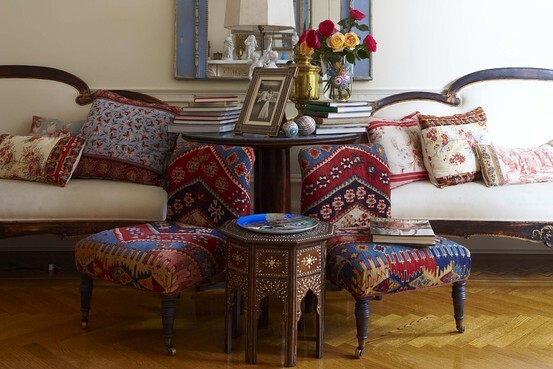 Seeing the floral prints juxtaposed with the bold ikats from Uzbekistan, "Eurasian flair" comes to mind. And that makes me think of the young, very much buzzed about fabric house, Tissus Tartares. The WSJ. Magazine has a great new story on the nascent fabric company founded by Olya Thompson and business partner Nathalie Farman-Farma, and you can see Farman-Farma's Chelsea house in the February issue of World of Interiors. 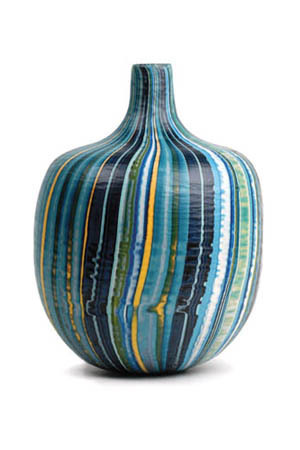 Colors of the Oasis remains on view in D.C. through March 13, 2011. In the National Gallery of Art film, Paul Mellon: In His Own Words, the museum's founding benefactor and long-time trustee says, "Collecting is the sort of thing that creeps up on you, prompted by a number of influences, some of which you are never conscious of...When I buy a [work] some feature about it may remind me consciously or unconsciously of some past thought or feeling, moment of pleasure, or even sadness. 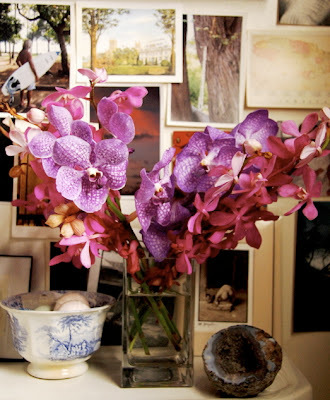 It might just be a fortuitous combination of colors, a certain calmness, or a beautiful sense of proportion." The NGA's 48-minute film about Mellon can be downloaded for free in iTunes (under podcasts, not documentaries). Related past post: Lahariya II. 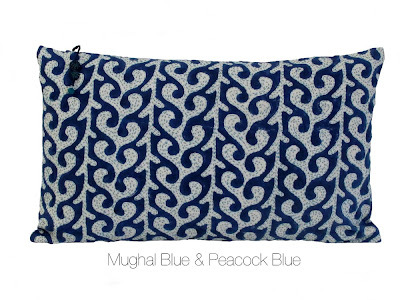 Mood indigo continues with a 17th-18th-century handspun cotton cloth from Sari to Sarong: 500 years of Indian and Indonesian textile exchange. 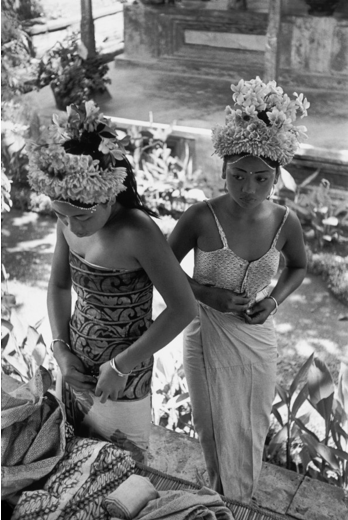 The hand-drawn batik cloth was created for trade to Indonesia using natural dyes, as well as mordant block-printing. 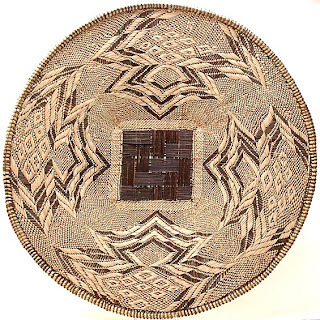 More on the 2004 textile exhibition here. Maybe balmy destinations and sarongs are on my mind because Gauguin: Maker of Myth opened today at the National Gallery in D.C. Not since the 1980s, when the NGA's major retrospective, The Art of Paul Gauguin, was organized, has there been a Gauguin show of this magnitude in the U.S.
One more from Henri Cartier-Bresson: The Modern Century: the photographer's Preparations for the Baris Dance, Ubud, Bali, Indonesia, 1949. And an intricate piece from Set in Style: The Jewelry of Van Cleef & Arpels, on view at the Cooper-Hewitt through June 5, 2011. With a delicate head of carved turquoise, this brooch represents the firm's creative exploration of international motifs. 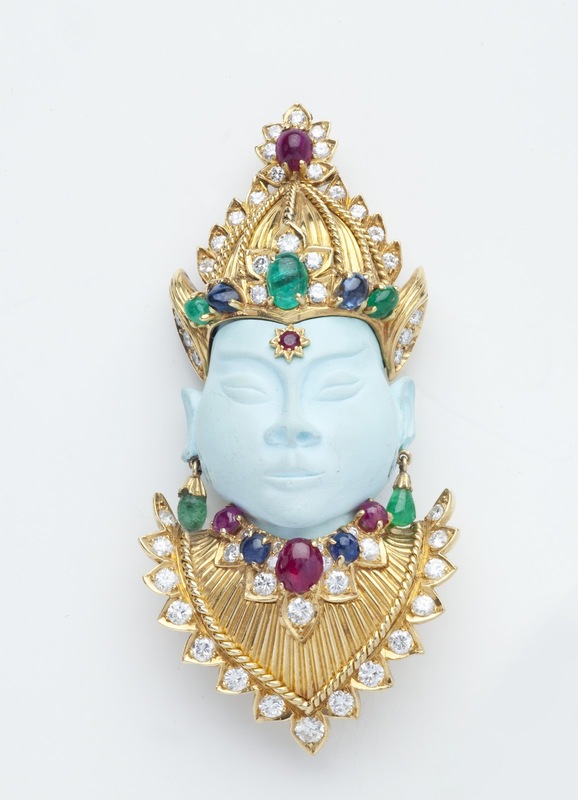 Globe-trotting clients influenced Van Cleef & Arpels greatly during the 20th century, and Exoticism is a key theme in the glittering exhibition. Related past post: Virtual Escapes. We're all very accustomed to Western fashion and interiors with Chinese influences -- in Ralph Lauren's fall 2011 collection there are nods to The Last Emperor and 1930s Asian glamour -- but I have to say, I know very little about Indian textiles with Chinese motifs. 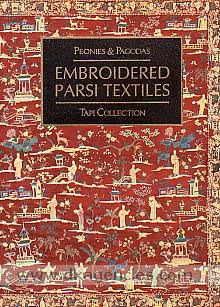 The latter is the focus of a new book, Peonies & Pagodas: Embroidered Parsi Textiles. I mentioned this title last year but haven't noticed it for sale yet in the U.S. Good news though: it appears that the book can be ordered through Vedams. 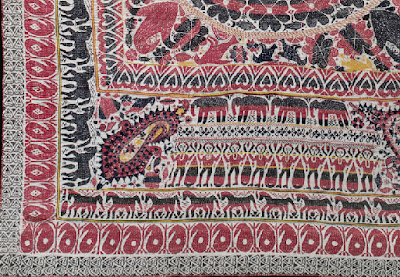 The catalogue draws from textiles in the TAPI Collection, specifically pieces worn by Parsi women and children in the 19th and 20th centuries. Editors Shila Shah and Tulsi Vatsal describe the textiles as "embroidered with exotic Chinese patterns—pagodas, pavilions, bridges, peonies, bamboos, peacocks and phoenixes—executed mainly in monochromatic white on brightly colored silks." Because Parsi merchants collaborated so well with the English East India Company, the editors attribute the Parsi penchant for Chinese design in part to exposure through international trade. The "Chinamania" that swept through Britain in the 19th century is said to have influenced Parsi tastes, too. Related past post: Summer Reading. 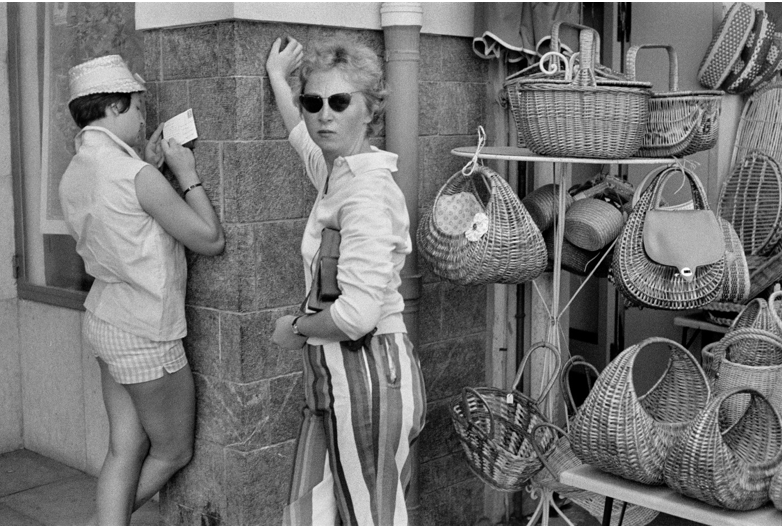 Of course, Henri de Toulouse-Lautrec observed the world around him, too. 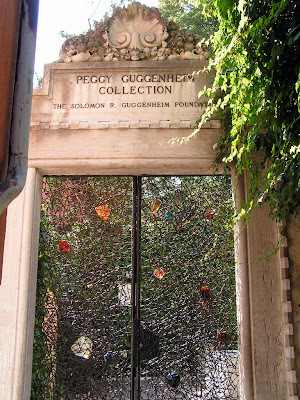 As mentioned last month, the High is home to Howard and Irene Stein's world-renowned collection of works by Toulouse-Lautrec and other artists of his era including Gauguin, Degas, and Bonnard. 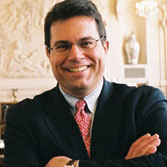 The Museum's Director of Collections and Exhibitions, David Brenneman, will talk about the stellar collection tomorrow night, February 24, at 7 p.m. in the High's Hill Auditorium. The event is free but tickets are required. Click here for details. I'm only part way through Nada Chaldecott's book, Dhurries, but she has opened my eyes to a world of rhythmic patterns beyond the iconic stripes I already love. 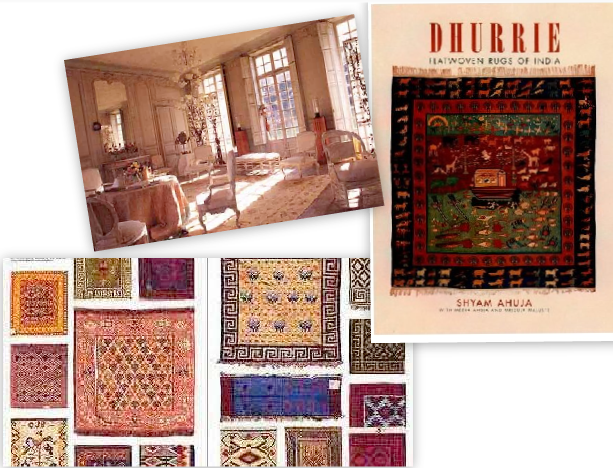 And now, thanks to a tip from textile designer Seema Krish, I've added another dhurrie edition to my wishlist: Dhurrie: Flatwoven Rugs of India by Shyam Ahuja. Like Chaldecott's comprehensive work, this volume also shines a light on rugs that have been less appreciated than their knotted pile carpet cousins. When I Googled Ahuja searching for past reviews, I came across a related 1980s Times piece on the rise of the humble Indian dhurrie. 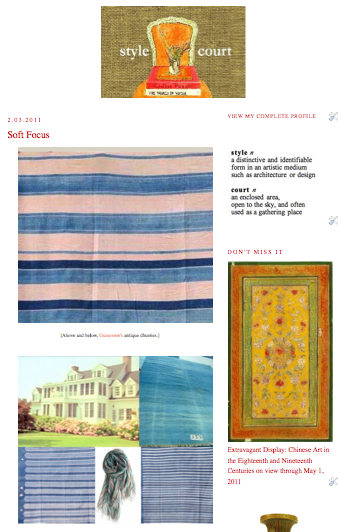 Seema's own work, shown here at the top, is informed by her Indian heritage and she has an impressive textile-related library, so I listen when she recommends a book. 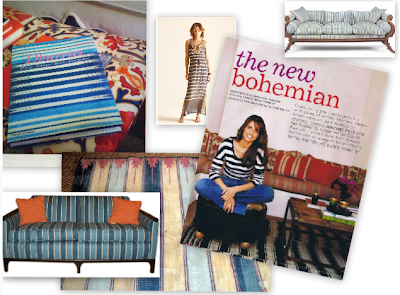 To learn more about her studio and collection, click here and here. Related past posts: Soft Focus and Continuing the Thread. And a friendly reminder: LACMA's lavish exhibition, India’s Fabled City: The Art of Courtly Lucknow, closes in five days on February 27th. After the balmy long weekend we just experienced in Atlanta, a post about antidotes for the winter blahs seems really ill-timed. 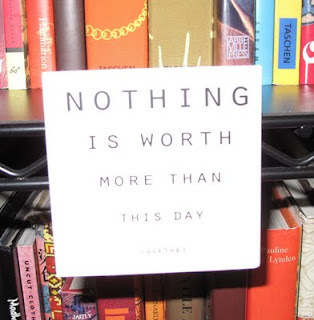 But rather than scrap everything I had planned, I do want to share a few quick links. 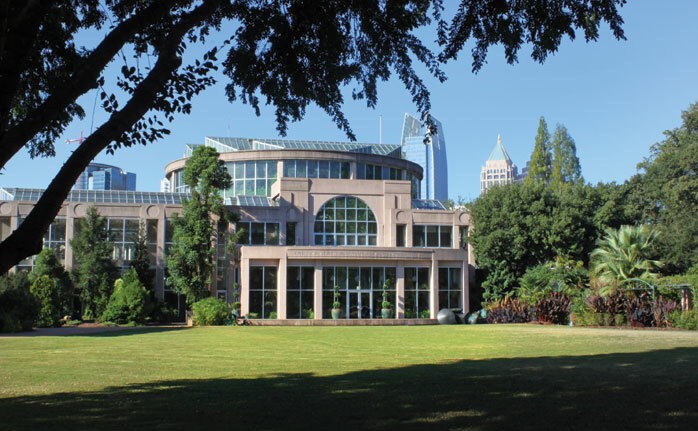 The Atlanta Botanical Garden's Fuqua Orchid Center houses the largest collection of species orchids in the U.S., and the tropical assortment comes into focus each winter with Orchid Daze -- a celebration that involves weekend orchid markets, orchid care clinics, cooking demonstrations and, most importantly, exhibitions of phalaenopsis, dendrobiums, cattleyas and other exotic plants. This year's Orchid Daze: Liquid Landscapes will extend into April. 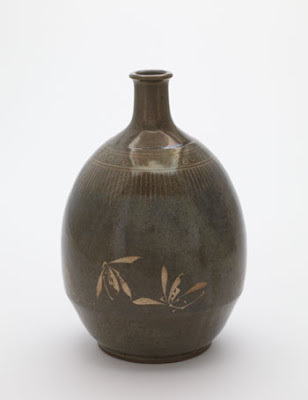 The bottle I chose to share, above, is Japanese, but orchids in Chinese paintings are the focus of a current exhibition at the Arthur M. Sackler Gallery in D.C. The show compliments Orchids: A View from the East, on view at the National Museum of Natural History through April 24, 2011. The thoughtful postcard definitely took me back to Dining By Design, 2007, and Margaret Russell's tented vignette with Isnik-inspired fabrics by Mehmet and Dimonah Iskel. Truth be told, the creative tables Margaret has been involved with typically are my favorites, so I was happy to see the editor is being honored this year for her contributions to DIFFA (Design Industries Foundation Fighting AIDS, the beneficiary of Dining By Design). She is credited with helping the event grow from a smaller one night, one city affair to a highly-anticipated multi-evening series that tours nationwide. Read all about the 14th annual happening here. Here's a preview of things I'll explore soon. On the museum beat, Echoes of the Past: The Buddhist Cave Temples of Xiangtangshan opens at the Sackler at the end of the month. This exhibition blends the real with the virtual -- ancient sculpture with digital elements. I'm intrigued because of my interest in Chinese art, but I'm also curious about the highly creative use of digital technology. Previously on view at the Smart Museum of Art, the landmark show uses advanced 3-D scanning equipment to reconstruct a lost Chinese treasure. 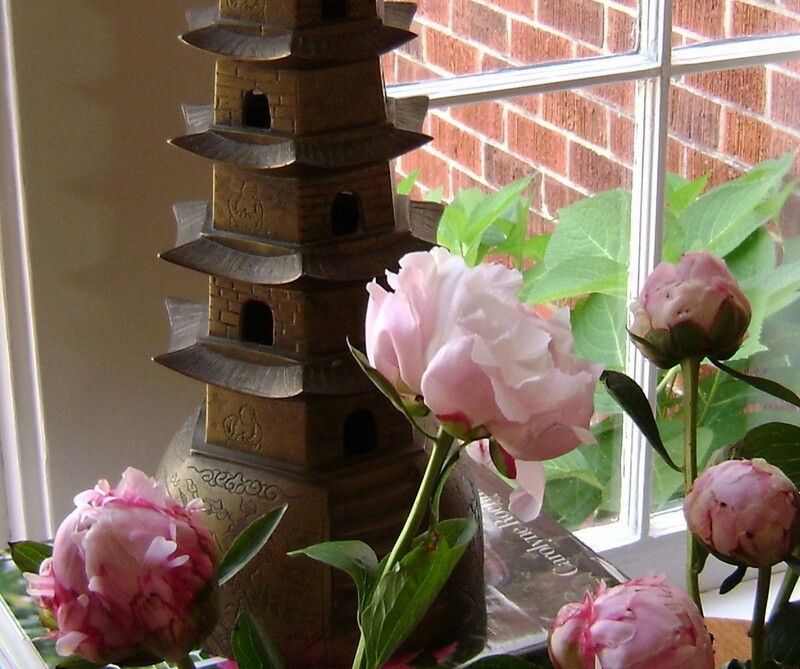 In the 20th century, the contents of the stone temples were dismantled and offered for sale on the global art market. For the new exhibition, an imaging team photographed and scanned roughly 100 pieces scattered around the world in museums and private collections -- objects thought to be from Xiangtangshan -- to recreate the original appearance of the caves. Visitors to the Sackler will see the largest version of the installation, encompassing 13 Xiangtangshan sculptures from the permanent collection of the Freer Gallery of Art. Shifting gears to something far more humble, the fourth installment of my "Projects" series will deal with hand-painting fabric. You're probably having visions of summer camp projects gone bad, but I couldn't resist a little experimenting. The final inspiration board is heavy on Nathan Turner. 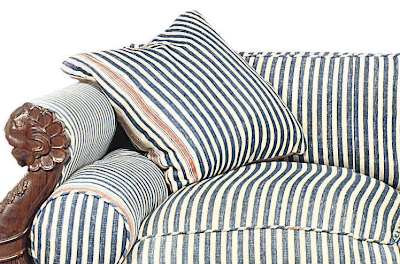 But if I decide my project leaves something to be desired, there will soon be a new pillow-filled shop in town. Next month, Atlanta's Westside will welcome another boutique: Jonathan Adler's 14th free-standing location opens at 1198 Howell Mill Road on Friday, March 25. The 3,000 square-foot store will occupy a reclaimed building next to Taqueria del Sol. Hand-loomed wool pillow and leather elephant footstool shown above are both samples of JA's current wares. Related past post: Projects: Block-Printing on Linen. [George IV Mahogany Daybed, Circa 1830, Attributed to John Taylor. After reading this old review in the Journal of Design History, I'm even more anxious for my copy of Nada Chaldecott's book, Dhurries, to arrive. When it does, I'll share my own less erudite impressions. In the meantime, here's a terrific use of dhurrie as upholstery. 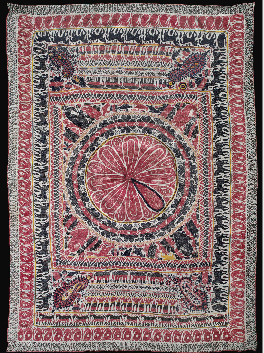 Lends a relaxed feel to this stately early-19th-century piece from a 2008 Christie's sale. 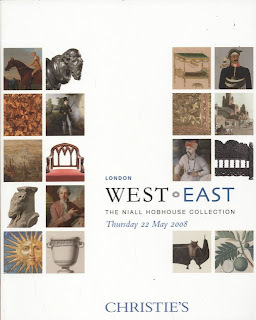 I didn't buy the Hobhouse catalogue at the time of the sale, but I recently spotted it here. Julep cups are usually my go-to containers for blooms cut short but sometimes I'm in the mood for an earthier look, like the Baule pottery posted last year. 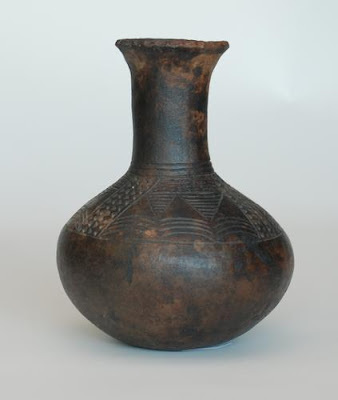 At the moment, this seven inch vase handmade on the Ivory Coast of Africa is calling my name again. 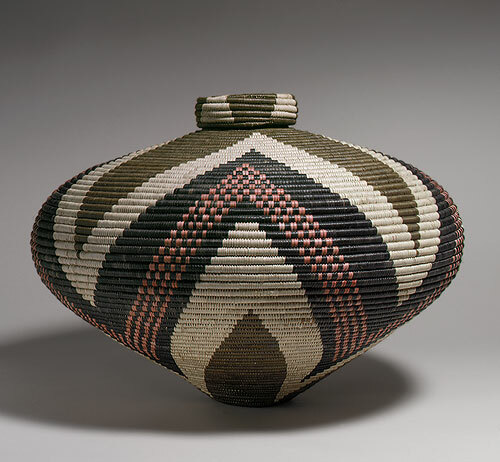 The Museum for African Art gift shop offers an array of these ceramics, which are discounted this month as part of a store-wide 50 percent off sale. 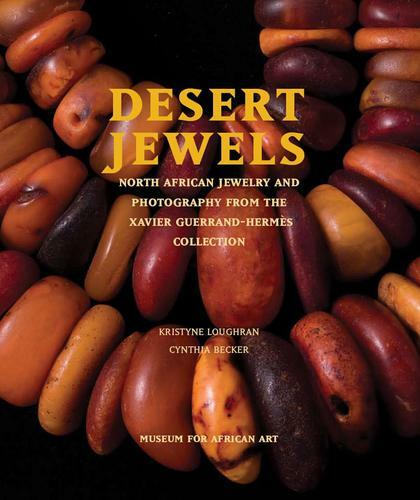 Books are not discounted, but I noticed that the exhibition catalogue published to accompany Desert Jewels: North African Jewelry and Photography from the Xavier Guerrand-Hermes Collection is still available for an easy-on-the-budget $19.95. In case you missed the update to the previous post, the latest issue of RL Magazine highlights the Museum's future home designed by Robert A. M. Stern Architects for a prime spot on Museum Mile. Renderings show trapezoidal windows inspired by African basket weave. I'm well aware that the patterns of the baskets above aren't dopplegangers for the windows; they just caught my attention today. 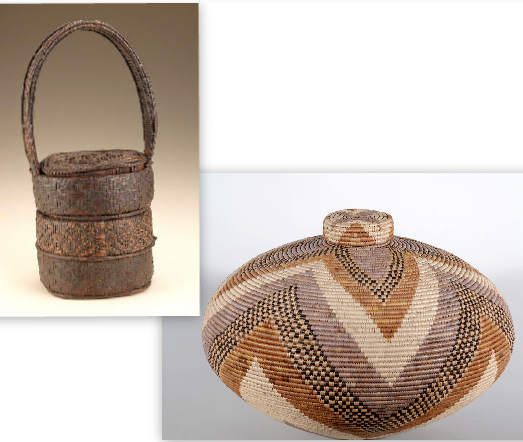 Not for sale in the gift shop, the two very graphic examples with zigzags were made by contemporary South African weaver, Beauty Nxgongo. 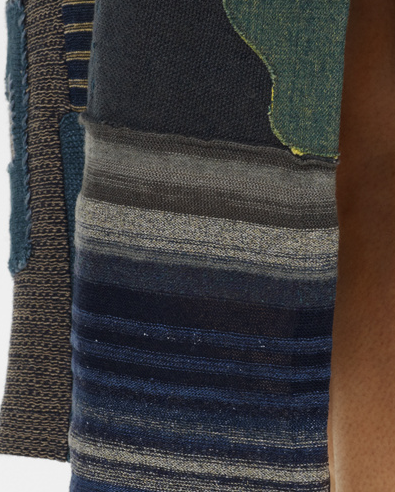 Her work is represented in The Met's permanent collection and she uses natural sources to create her colors. Related past posts: Sweet Greet and There's More. Kanthas -- I never tire of looking at them. Some Textiles have a sameness, but each kantha has an individual quality. 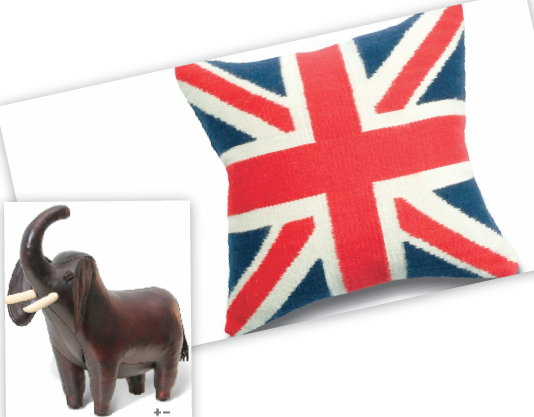 They are folk art. 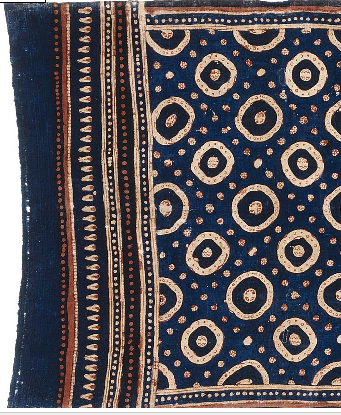 The antique kantha shown above-- an embroidered Bengal textile made with recycled remnants from old clothes, such as saris -- is not from Second Lives. This example is a favorite from the 2010 exhibition, Kantha, highlights of which can still be enjoyed here. 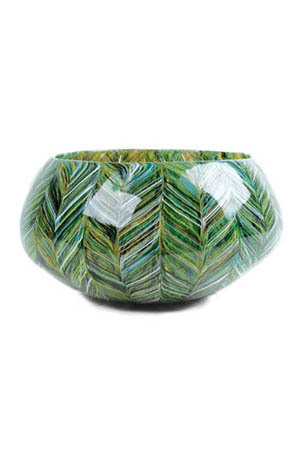 And the gorgeous accompanying catalog remains in stock, too. I'll be back soon with a proper post but in the meantime I want to leave you with this link to RL Magazine's coverage of Second Lives, as well as Merry's piece. Both are definitely worth a look. RL also covers an upcoming addition to NYC's Museum Mile, the Museum for African Art. The story notes that the new facade, designed by Robert A. M. Stern Architects, will feature trapezoidal windows suggestive of African baskets. Plateau basket available here. Past posts that reference African design can be found here. I envy the packed crowd sitting in LACMA's Bing Theater tonight. Steve Martin is scheduled to be there talking about his latest novel, An Object of Beauty. (Fingers crossed for the museum to film the conversation and later share it here.) If you're not familiar with Martin's new book, it explores the contemporary art business and the roller coaster of the last two decades. Oh so cleverly, he seamlessly weaves in some art history, too. But, above all, the novel is about the collector's drive. Partly because Martin's book has been on my mind today, an exhibition at the Philadelphia Museum of Art Library grabbed my attention: Good Modern Work: Women Gallerists in America champions the pioneers who promoted art in the early part of the 20th century. Included are Peggy Guggenheim, Edith Halpert, Marie Harriman, Antoinette Kraushaar, and Mary Curran. 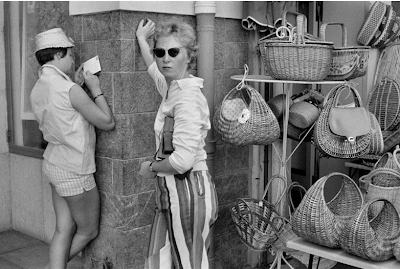 A 21st century collector of curiosities also caught my eye this week with her pictures of Jaipur. And by the way, you can click here to peek at LACMA's current exhibition, India’s Fabled City: The Art of Courtly Lucknow, on view through February 27, 2011.